Close bases all over the world. Turn them all into public housing. but want to know better. Prepare festive plates of food and cold beverages of all types. Decorate your house with sparkly lights and candles. Make Halliburton employees and CEO’s do all the cleaning. Dress in your brightest clothing and wait for your friends to arrive. Remove the word Military from the dictionary. Khadija Anderson returned in 2008 to her native Los Angeles after 18 years exile in Seattle. Khadija's poetry has been published in Pale House (forthcoming), Atticus Books (forthcoming), The Ark Magazine, Unfettered Verse, CommonLine Project, Qarrtsiluni, Gutter Eloquence, Unlikely Stories, The Citron Review, Killpoet, Wheelhouse 9, and Phantom Seed among other wonderful publications. Her poem Islam for Americans was nominated for a 2009 Pushcart Prize. 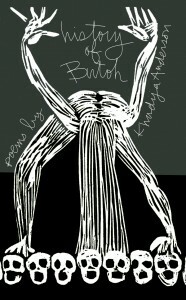 Khadija holds an MFA in Creative Writing from Antioch University LA and her first book of poetry History of Butoh was just published through Writ Large Press.